Alfie is the best jumper in his pond. Jumping from rock to rock, he can jump across the whole pond without touching water. He jumps so well because his legs are longer than the other frogs. He enjoys jumping up to catch flies with his tongue. Most frogs wait for the flying insects to fly by them and then...snap! Out goes their tongue and in goes the insect. Alfie gets along well with all the frogs except Mory. Mory lives on the largest of the lily pads. He thinks he is better than the other frogs. Mory is mean and bullies the other frogs. He makes fun of the frogs and calls them names. Mory threatens other frogs into doing things for him. They don’t want to get beaten up, so they do whatever he tells them to. He makes them catch food for him. They catch flies and other flying bugs with their tongues and give it to Mory. Gross! He is so mean! He sits in front of the path to the waterfall with his mob of bullies, and he won’t let other frogs pass until they pay him with food. Some frogs have just given up on going to the waterfall, except for when Mory is on the other side of the pond. Alfie comforts the frogs who have been tormented by Mory. Alfie also catches extra bugs to give to the smaller, weaker frogs to give to Mory. All the frogs like Alfie. All except Mory. Mory watches Alfie jump. He watches him take care of the other frogs. Mory is always watching Alfie. Mory has a problem down deep inside. He wishes he were like Alfie. He wishes he had friends like Alfie has. He is jealous of Alfie and his life. Almost all the frogs avoid Mory as much as possible. Alfie is aware of one small frog who is very afraid of Mory. Mory hit this little frog, Felix, when he didn’t move fast enough to please him. Felix tried to stay away from Mory, but one day he ran straight into him and his mob of bullies. Felix thought Mory was still on the other side of the pond. He didn’t spend much time under the waterfall, but it was too long. Felix was just coming out when Mory was going in. Felix tried to swerve but was not fast enough and collided with Mory’s shoulder. Mory thought about it. He wanted to make Alfie his slave so badly he decided it was worth the risk. Also, he thought he had a great chance to win if he could use two legs and Alfie only one, or he could cheat if he needed to. He would win one way or the other. He couldn’t wait for Alfie to work for him! He wanted to make Alfie’s life miserable. Mory sneered, “You’re on, and I’ll even let you pick the time and the place!” Alfie gave the time and location of the contest. On the day of the competition, all the frogs gathered to see the outcome. The only ones rooting for Mory were his mob. Alfie had a plan when he chose this spot under the old tree and hoped it worked. Alfie didn’t want Mory to think he was using two legs. He had Felix tie a vine around his leg and over his head and shoulders. It was now impossible for him to use two legs. The tree was used as a way of marking how high they jumped. Felix said, “Ready… Set… JUMP!” They both jumped very high. All the frogs agreed it looked like a tie so they did it again. This time it was clear, Alfie won! Mory crunched down and lifted as high and hard as he possibly could. Up and up he went until… He didn’t come down! He was stuck in the tree! There in the tree was a point where the branch made a fork and his head and shoulders were stuck in it! Alfie told the frogs Mory would be alright. The insects were still buzzing and he could eat any he wanted, if he remembered how to catch his own. 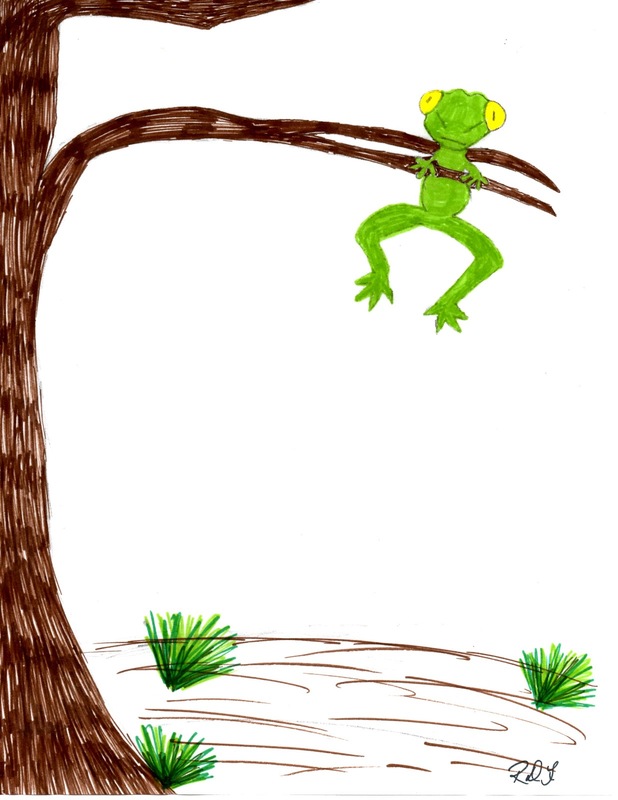 The frogs laughed at the sight of Mory hanging there and picturing him having to catch his own food for a change. Mory stopped yelling and threatening them as soon as he realized no frog was listening. All through the night he heard the crickets chirping, the fireflies buzzing, and an occasional frog croaking. He missed the frogs, but he was still angry. He hung there the next day and through another night. Mory was thinking about what Alfie had done and how he had acted all his life. 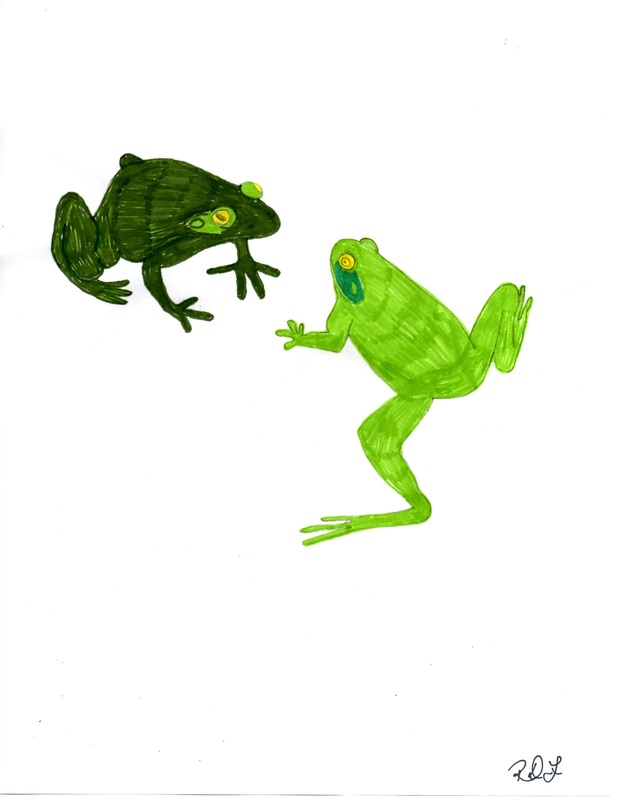 He remembered how the frogs looked to Alfie as a friend. He pictured how they cowered around Mory. He also thought about how smart Alfie had been to get him stuck there. He started thinking he should change. Mory did. Then Felix climbed down, then the next, and the next, until they were all down. Mory’s legs were a little shaky so he just sat down. Alfie told him he was proud of him. Mory smiled and asked, “Anyone want to sleep on my lily pad? I have plenty of room and it belongs to all of us. I want to invite any of you to enjoy the water fall too. I won’t stop you. I’ll also catch my own food. I forgot what fun it was.” Mory became a friendly frog. He had learned his lesson. Alfie is an example of one who loves others and is kind. Which one do you want to be like? Do you want others to like you? If so you should be like Alfie. Mory is an example of a bully. Do you have someone in your life who is unkind to you? Maybe someone is a bully to you? Has someone been so mean that you are afraid? Maybe they have threatened you to not tell. The right thing to do is to tell your parents. Please tell your parents if someone is mean or a bully to you. They will be able to help. It will help you and the one who is bullying you. Mory was glad he wasn’t a bully anymore. Bullies need to learn not to be a bully. You may be the one to help them see clearly what they are doing. Maybe you have acted like a bully. How do you think Jesus wants you to act? The Bible says, Ephesians 4:32 And be kind to one another, tenderhearted, forgiving one another, even as God in Christ has forgiven you. Proverbs 11:17-20 The merciful man does good for his own soul, but he who is cruel troubles his own flesh. The wicked man does deceptive work, but he who sows righteousness will have a sure reward. As righteousness leads to life, so he who pursues evil pursues it to his own death. Those who are of a perverse heart are an abomination to the Lord, but the blameless in their ways are His delight. In other words, be nice to people and you will get a reward from the Lord. When you are mean, you are really doing it to your own self. A "perverse heart" is a wicked heart, and "abomination" means God extremely hates it. Memorize: Proverbs 11:20 Those who are of a perverse heart are an abomination to the Lord, but the blameless in their ways are His delight.